The list of King Henry VIII characters provide a convenient introduction to the William Shakespeare play summary of King Henry VIII. The male and female characters bring the plot of the play to life. Not only do we remember the stories but we remember the people - we all have our favourite characters. The following short summary of King Henry VIII provides a brief description of this famous William Shakespeare play. The story of the plot with its famous characters via the summary of King Henry VIII. Interesting facts and information about the Globe Theatre of Elizabethan London with a William Shakespeare Play Summary of King Henry VIII with a list of Characters. This drama is one of the great history themed plays by William Shakespeare. Queen Katherine of Aragon is upright and virtuous and married to King Henry VIII. Henry was a proud and wilful monarch who defies Rome's ban on divorce to marry Anne Boleyn. 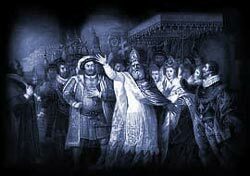 Cardinal Wolsey, the Powerful Lord Chancellor of England, attempts to bend Rome to the king's wishes in the matter of the divorce of Katharine so he can marry Anne Boleyn. Later, near death, he repents his unpriestly activity. Katherine is divorced and sent to Kimbolton Castle and Anne marries King Henry VIII to become his queen. Interesting Facts and information about the Summary of King Henry VIII and Characters. Additional details, facts and information about the Globe Theatre and the summary and characters of other William Shakespeare plays can be accessed via the Globe Theatre Sitemap.